Enables the user to sleep better, eat more, restoring memory and refreshing the mind. Helps stimulate and restore the functions of the organs of the infirm or aged, and of those weakened after illness or childbirth. Spirulina provides the most abundant natural protein source. Spirulina derived from Hawaii Sea has the top quality and is the #1 scientist recommended green food in the 21st century. Spirulina, a blue-green algae, is abundant in protein, Vitamin B12, amino acids, beta-carotene and minerals. This nutrient powerhouse is easily digested and high in Vitamin K, chlorophyll and RNA and DNA nucleic acids needed in body repair. Due to the valuable nutrients contained in Spirulina, thousands of health-conscious dieters make it part of their reducing diets. This nutritional wonder also helps balance blood sugar and increases energy levels, as well as feed the brain and glandular system. Recognized the world over as the most promising of all microalgae, spirulina is being considered as an immediate food resource. Spirulina thrives in hot sunny climates and in alkaline waters around the world. It represents a breakthrough in the production of food, producing twenty times the amount of protein as that of soybeans on an equal land area. 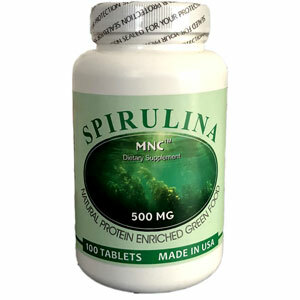 Spirulina contains concentrations of nutrients unlike any other single grain, herb, or plant. It contains gamma-linolenic acid (GLA), linoleic acid, arachidonic acids, high amounts of B12 needed (especially by the vegetarian) for healthy red blood cells, high iron content, 60-70% protein content, the essential amino acids, RNA and DNA nucleic acids, chlorophyll, and a blue pigment (phycocyanin) found only in blue-green algae. Spirulina is a naturally digestible food that aids in protecting the immune system, in cholesterol reduction, and in mineral absorption. Spirulina is beneficial while fasting. It supplies the nutrients needed to help cleanse and heal, while also curbing the appetite. The hypoglycemic individual may benefit by using this food supplement between meals because its high protein content and help stabilize the blood sugar. This preparation has a sedative effect for the central nervous system and is most efficacious for the common symptoms of neurasthenia such as insomnia, incubus, amnesia, dizziness, poor appetite, palpitation, depression, etc. 5 to 7 days of administration will bring about desired effects, enabling the user to sleep better, eat more, restoring memory and refreshing the mind. It has proven therapeutic effects for coronary heart diseases as thorax depression, dyspnea, dizziness, angina pectoris, etc. Desired effect is brought about in 2 to 3 weeks of administration. Prolonged administration will give better effects. Satisfactory results for general debilitation senility, sore limbs or arthritic pains. Through long research and clinical practice, it has been observed that this preparation, to different extents, cures leukopenia caused by hypsiotherapy and chemotherapy. This preparation also helps stimulate and restore the functions of the organs of the infirm or aged, and of those weakened after illness or childbirth. Other ingredients: Dicalcium phosphate, Stearic Acid, Silicon Dioxide, Croscarmellose, cellulose. This product contains no corn starch, soy, wheat, milk, egg, sugar, salt, artificial color or preservatives. Store in a cool dry place. Neurasthenia, insomnia, incubus, amnesia, dizziness, poor appetite, palpitation, depression, thorax depression, dyspnea, dizziness, angina pectoris, general debilitation senility, sore limbs, arthritic pains. Take 2 to 3 tablets daily.